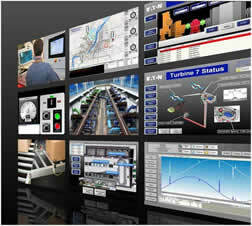 Eaton’s XV and XP Series of operator interfaces offer high performance platforms that provide unmatched flexibility. Features slim OEM design and a variety of communication port options that include onboard Ethernet on all models. 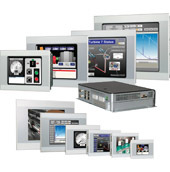 With screen sizes ranging from 3.5 to 15 inches, vast communications capabilities, and a single development software package, the XV and XP Series represent a complete solution to any Operator Interface application. The XV series is ideal for applications requiring extensive connectivity and the advanced features available in Visual Designer without the expense associated with more powerful open platforms. The XP models are perfect for OEMs who require extensive connectivity, advanced features in Visual Designer, have large or high speed applications, or need an open platform for running third party software. The unique infrared touchscreen with scratch resistant safe ty glass is ideal for harsh environments where traditional touchscreens are easily damaged. Protect Mode, available only on Eaton’s XP embedded operator interface products, protects the operating system from unwanted changes providing improved up-time and reliability. The same local user accounts and passwords for viewing and control also apply remotely for simplified security. Visual Designer runtime and web server licenses are pre-installed on all units, eliminating the hassle and cost of purchasing and installing separately. With Visual Designer software, XV and XP units can communicate with virtually any network, any PLC, any web client, and any database.